◆ GoldSpy - Gold & Precious Metals Tracking ◆ GoldSpy simplifies tracking precious metals spot prices, news & information for Gold, Silver, Platinum & Palladium. 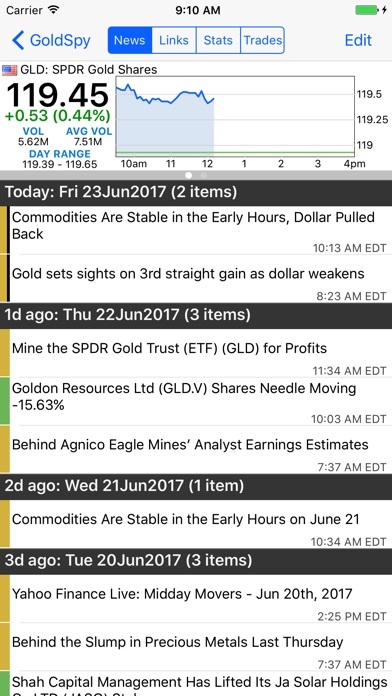 GoldSpy allows you to VISUALIZE how the news affects prices of ETFs and Metals stocks with NewsCharts! 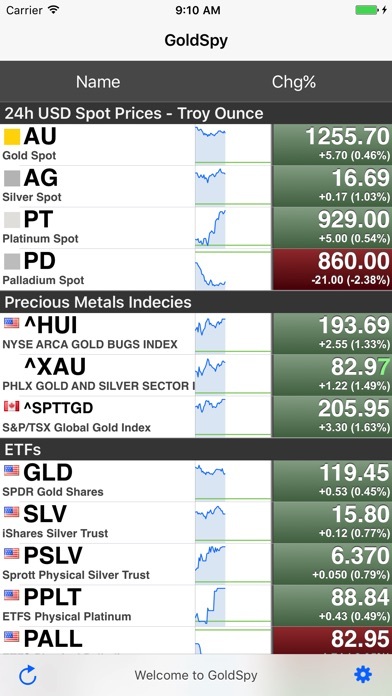 ◆ GoldSpy tracks... ◆ ► 24 Hour Spot Prices for Physical Metals Gold, Silver, Platinum, Palladium ► Precious Metals Indecies HUI (AMEX Gold Bugs Index), XAU (Pillidelphia Gold & Silver Index), TSX Global Gold Index, GDM (AMEX Gold Miners Index) ► Precious Metals Exchange Traded Funds (ETFs) GLD, SLV, PPLT, PALL, GDX, GDXJ, XME, AGQ, UGL, SGOL ► Holding Companies/Non-Miners CEF, PHYS, SLW ► Miners ABX, GG, NEM, AU, KGC, AEM, GFI, AUY, BVN, HMY, GOLD, IAG, EGO With GoldSpy you can automatically load several top quality RSS news feeds for each of the symbols (non-spot symbols only) it tracks. This provides you with more complete information when making your important investment decisions. Stop losing money because you're not getting all the important news & information about your stocks and ETFs. 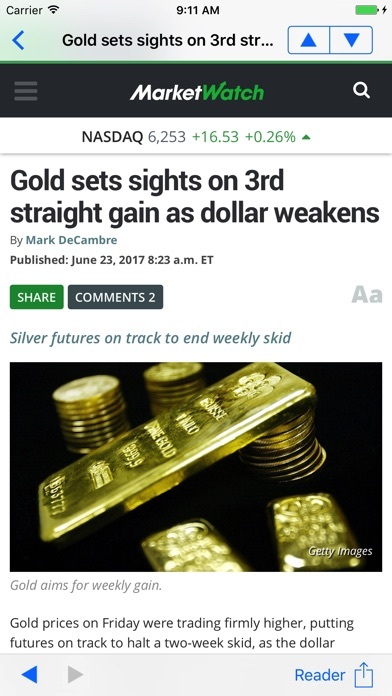 Say goodbye to wasting time by manually checking several news websites and still not getting the whole picture of the precious metals market. Start making more money because you have the information to make smart trades. NewsChart technology shows you how the news volume changes over time. As you scroll through the news articles the NewsChart highlights the currently active bar for the visible news items in the news list. This means if you find a day which had interesting price change (like a big pop or drop) you can easily find out what news was "driving" the stock. GoldSpy provides easy access to information from the top Investor websites with Symbol Specific website links. This allows you to browse detailed information about specific stocks having to type a symbol. With recent volatility in precious metals prices and the global financial markets access to timely investment information is a necessity. 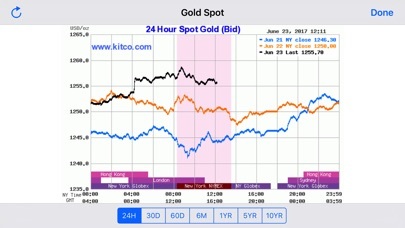 With GoldSpy for iPad this information is at your fingertips. ◆ UPDATES Stay tuned, because we're always developing new and exciting features for GoldSpy. 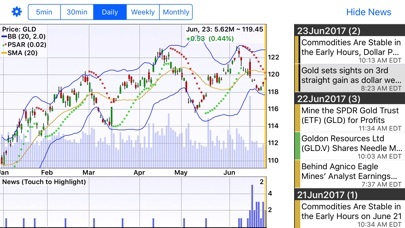 ◆ FEEDBACK We want your feedback to keep GoldSpy the #1 precious metals tracking app! ◆ HELP & SUPPORT Remember to mail goldspy@stock-spy.com. We are always happy to assist and take pride in providing prompt and helpful support! ◆ Go ahead! Get your copy of GoldSpy today. You won't regret it! More by StockSpy Apps Inc.